THANK YOU! This is it…thank you…purchased it. Please tell Danielle thank you. I’m looking for a replacement bunny. It has a tan or beige velour head and paws. The arms are blue gingham and the legs are pink gingham. The front is white with 3 flowers embroidered on it. It was likely purchased at a place like Walmart or Target around 1999. The story all began when we were missionaries in Thailand where my daughter was born. Grandma gave her the bunny before she could walk and it has resided next to her every night of her life since then. If the bunny is missing, all activities stop until Search and Rescue has completed a successful mission. This bunny is very much a part of all our lives and likely still has dirt on it from the tribal villages she grew up in. Somehow I underestimated how attached Dad is with this dear pile of rags. We have shared tears and tea parties and Bah Bye and I have been dressed for such occasions more than I can tell. If you can help Gary find this Tan Rabbit with Pink and Blue Gingham Arms and Legs, THIS SITE IS NO LONGER ACTIVELY MANAGED. Please use Our FREE FACEBOOK GROUP, including #091608-1 in the subject, . It’s a carter’s brand. I didn’t find the rabbit, but found the matching rattle. ebay Item number: 270260912630. Do you think it is same brand? You’re right. I just has to be a Carter’s. That was my first guess, anyway. Good detective work going on!! LOL! If you decide you need a bunny surgeon you might want to check out Hanna’s Teddy Hospital link on the right side bar. That’s what she does!!!! 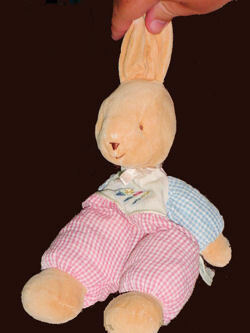 Did you find the real doll or the rattle that is similar to the real bunny doll? I think I’m the one who found the real bunny, but it all blurs together after awhile. LOL!! Anyway, this one is closed. I’m looking for a Carter’s cream colored bunny with a rattle inside it. It has pink ears and a gingam pink bow. My dughter is so upset without her best friend! !